Not a good habit to get into. Neat if you want to avoid programming, but looks like it was pulled from the .net codebehinds. 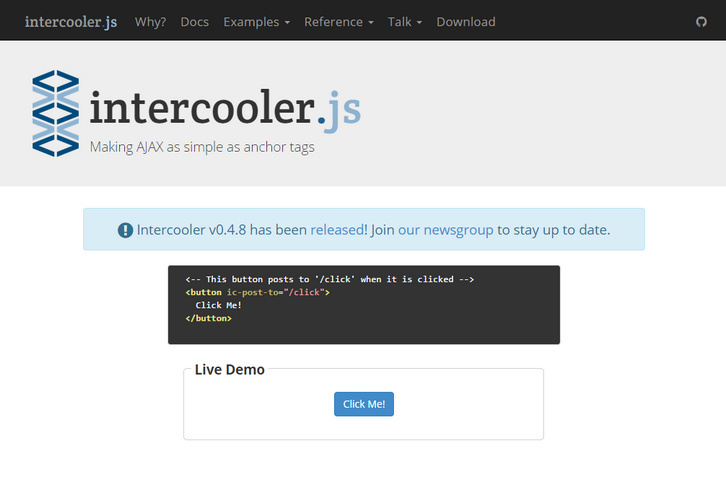 Intercooler has nothing to do with code-behind, it’s a REST-ful partial HTML library, and it’s a much better approach to AJAX for most web applications than other options: simpler, easier to reason about, easier to test. Seriously, read at least a bit of the documentation before you start commenting on it. Seems like a neat way to avoid coding and give designers and other non-devs the tools to make powerful websites. I don’t see this as a general tool to build large and complex sites, though.